This is where your beautiful smile begins with our in-office or take-home Philips Whitening Systems! This limited time offer extends to current and new patients alike. Schedule your appointments today by calling 401-364-6300 or filling out the registration form below. In-house whitening system coupled with custom whitening trays following your whitening appointment. This kind of whitening is especially effective if you have deep discoloration, maybe from years of smoking, drinking wine and coffee, or taking certain types of medication. Whitening with whitening lamps gives the most intense results, accelerating ingredients to get to work and reverse staining. With one of our home whitening kits, you can brighten your smile gradually and conveniently with a treatment that fits into your schedule. Personalized treatments, prescribed by your dentist, give you peace of mind as you whiten at home. Available with both Philips Zoom DayWhite and Philips Zoom NiteWhite whitening gel. As part of your kit, you’ll also get our post-treatment gel that helps to protect enamel and reduce sensitivity. 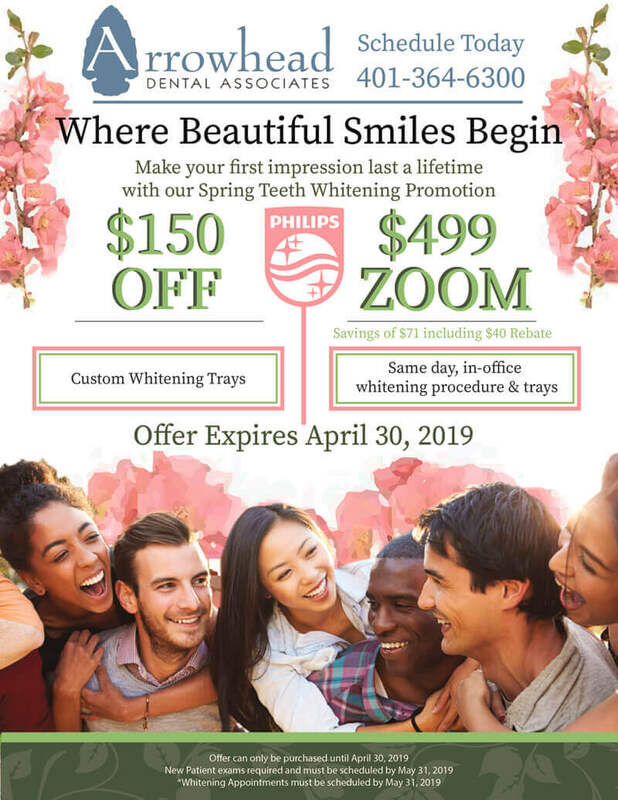 *Whitening Appointments must be scheduled by May 31, 2019.